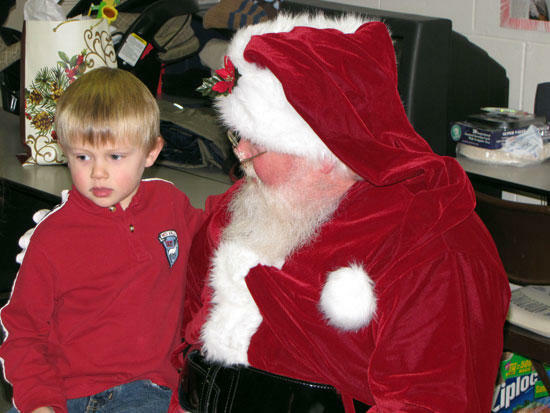 Santa Claus made a surprise visit Thursday from the North Pole to the Adams Memorial Library in Auburntown and Woodbury. Awaiting him were many children from infant to age 4 years old. Patty Chappell, who has the reading program for the children at the Woodbury branch of the library, was anxiously awaiting the “Jolly Old Elf” to come hear the request of the children. The children squealed out when Santa walked into the little get together in the lower part of the library. Some of the children were shy at first to approach Santa, but with a little encouraging from their mothers they finally went to him.